The Firefly 3 slave unit isn't something that I've needed to use a lot as my flashes all have a built in slave mode already. That said, it's a nice to have and could quite easily have a use triggering an old manual flashgun without slave mode. For field macro, it is too slow to really be any use. 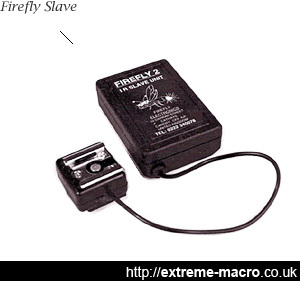 Firefly Flash Slave. Does what it says on the tin but does it very slowly. Basically, once this thing has triggered successfully, it emits a green light 'yes I've done it' light. But until this light is out, you can't trigger the flash again. Which is the reason it's not at all the right product for field macro. A slave unit is a useful flash photography device that will remotely trigger a flash at the same time as the primary flash is fired. The primary flash is manually triggered: it might be handheld flash that you press a button on, or it might be the camera's built in flash which is fired by you pressing the shutter release button or perhaps an off-camera flash attached to the camera's hotshoe via a cable. regardless there has to be a manual input to fire the primary flash. The slave unit then detects that the primary flash gun has been fired, and simultaneously fires the secondary flash gun that it is attached to. Slave units typically work by detecting the sudden change of light that occurs when the primary flash fires. Some work on visible light whereas others are sensitive to infra red light, and you can also get slave units that are based on radio technology. Flashes with built in slave units are nowadays not uncommon. They generally have a sensor on them and you switch into slave mode to operate. You can also buy slave units which attach to flash guns using the hotshoe attachment on the flash. The Firefly 3 is an example of this. The Firefly 3 triggers off infra-red light. This is good for two reasons: firstly it is more effective when the slave unit is not in direct line of sight to the primary flash (eg hidden around a corner) and secondly, it also means that you can fire the slave from an on-camera flash that does not emit visible light. There are two versions of the Firefly - the Firefly 2 and Firefly 3. The Firefly 2 is the cheaper version and works by firing on the first detection of another flash. The Firefly 3 is programmable so that it can ignore a sequence of flashes before eventually firing. The reason for this is that a lot of digital cameras fire a series of flashes before the main burst. This is generally to help the camera determine exposure information. If the Firefly fired at the detection of the first flash, it would fire before the camera had actually opened the shutter and would therefore not work. The Firefly 3 is programmable to ignore the pre-flashes and sync to the main flash. This is only necessary if your camera does pre-flashes and does not have a manual flash mode. My flashes have manual flash modes that will only fire one flash, but not all cameras have this, especially compacts. The Firefly 3 does what it says on the tin but does it very very (painfully) slowly. Basically, once this thing has triggered successfully, it emits a green light 'yes I've done it' light. But until this light is out, you can't trigger the flash again. Which is a limitation that makes it unsuitable for field macro. To be fair, it is intended for caving, and maybe it's perfect for the spelunking fraternity. The fact that it's programmable is very nice, because it means you can use it with *TTL modes which use a weak preflash to measure how bright the main flash needs to be. The instructions that come with it, however, don't correspond to how it acts in use, which was not consistent with me. All in all I can't recommend this product for macro: I hope that it is perfect for caving but for macro there is more suitable out in the market.